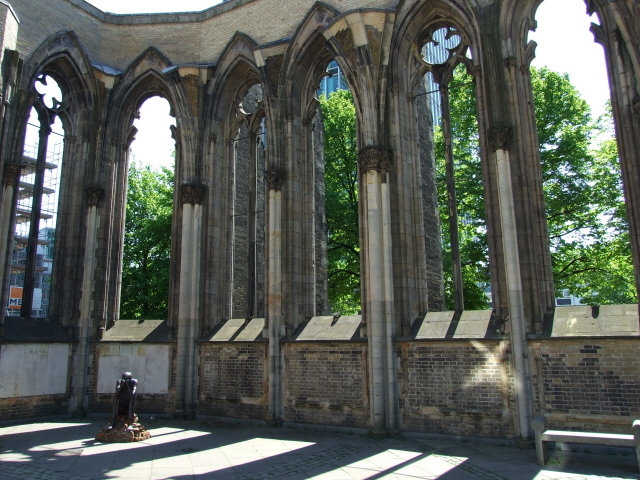 A memorial to the bombing of Hamburg in WWII: the main part is the ruins of the neo-Gothic Nikolaikirche church proper, of which little more than the church tower is still standing, which is, however, still a prime landmark of Hamburg's skyline. Its dark, sooty silhouette now serves as a reminder of not only the building's but also the city's destruction in the first Allied bombing raids aimed at major cities in July 1943 (named "Operation Gomorrah"). Tens of thousands of civilians perished in the firestorm brought about by a shower of explosive and incendiary bombs - and about half of the city's buildings were destroyed or badly damaged. 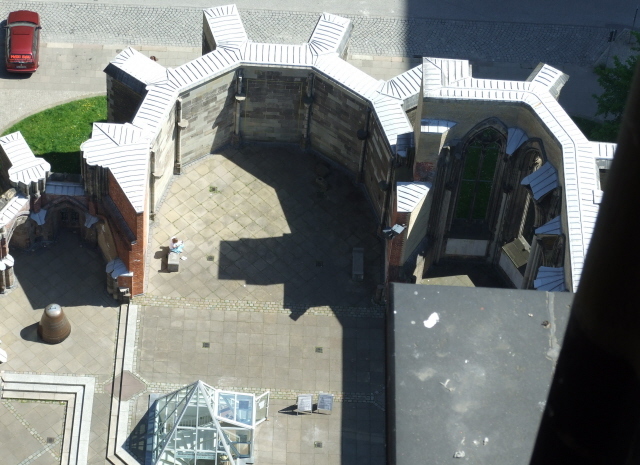 The church ruin today serves as a reminder of this darkest chapter in Hamburg's history, and as a memorial is supplemented by a small museum, which has recently been upgraded and expanded. More background info: Hamburg's Nikolaikirche, whose tower now serves as the centrepiece of the memorial, was built between 1846 and 1874 (to replace an earlier church that had burned down). 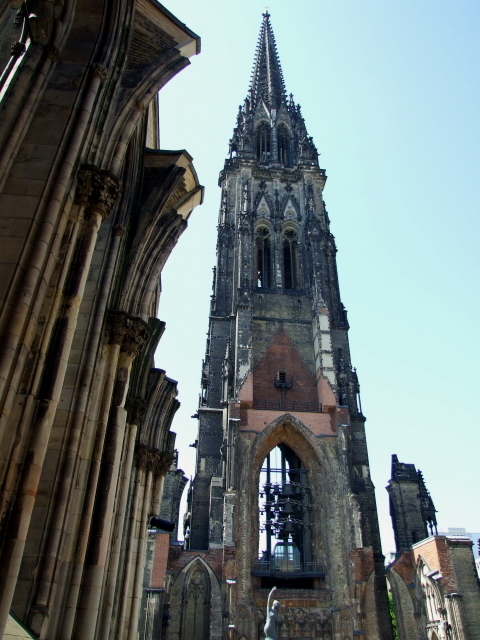 When it was finished, its 482 feet / 147m tower was the tallest building in Europe (until it was surpassed by the cathedral in Rouen in France), and it still is the highest church spire of the city (and the fifth highest in the world). Its height partly contributed to its fate – being the most prominent point in the centre of Hamburg, it was used by the RAF as a target and orientation marker in the bombings of the city. After the end of WWII, reconstruction was dismissed, and a replacement modern church was erected elsewhere, near the Klosterstern roundabout in the Harvestehude district of Hamburg. The ruined old St Nikolai church remained in ruins. Most of what remained of the church's nave was later even demolished, so that almost only the tower was left standing, which took on the role of a grim reminder of those dark days in the war. 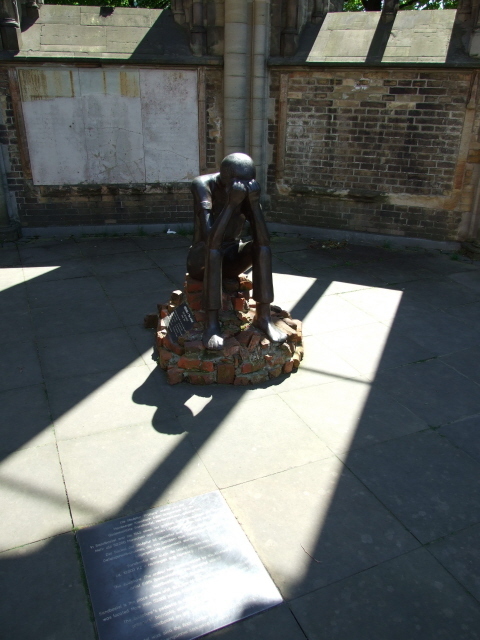 As a memorial, however, it had not been maintained very well for many years, and it took decades before funds were raised for restoration work and the setting up of a proper memorial site. 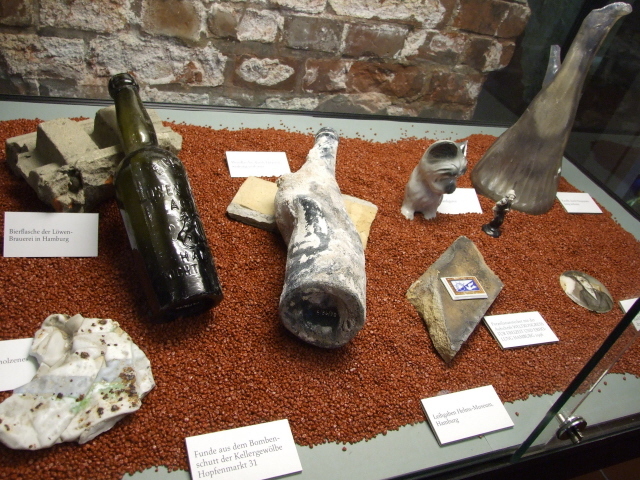 This now also includes a museum, updated and expanded in 2013, in the former crypt of the church. The tower has been made accessible by means of a lift to an observation platform. What there is to see: The recently upgraded and expanded memorial museum in the former crypt of the church (reopened in September 2013) is probably one of the best places to learn about what massive aerial bombings of cities really mean. To pre-empt the conclusion: it was/is a war crime (that, by the way, is also the conclusion a British (sic!) historian, whose book I read at the memorial but cannot remember the name of, arrives at ... against all the attempts of Bomber Harris, Churchill et al. to justify the bombing strategy ideologically). The exhibition does not, however, hammer that conclusion in, far from it, but it lets you arrive at it in your own time. Nor does it deny Nazi Germany's responsibility for having let it come so far in the first place – nor the fact that it was Nazi Germany that started it all. 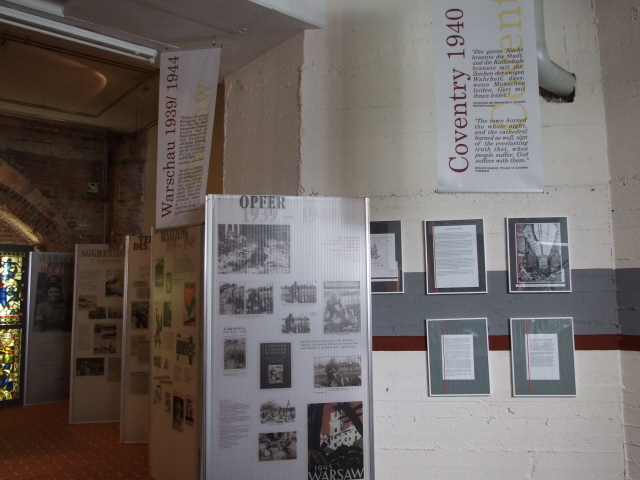 That latter point was even more prevalent in the old exhibition which had a fairly large section on the German Luftwaffe's bombings of London and, in particular, Coventry. This is now somewhat reduced in the new exhibition. What has been retained, however, are sections about Germany's use of aerial bombing in the destruction of Poland's capital Warsaw during WWII – in fact these sections have been on permanent loan from the Historical Museum of Warsaw since 2009. But let's briefly go through the sections of the current exhibition as they are ordered (mostly chronologically, that is). The first bit I saw when I was last there (in early May 2014) was a temporary exhibition – namely about a French comic on the barbarism of the First World War (called “Tour le monde kaputt”). This of course will have been replaced by something else (if anything) by the time you read this. The first section of the permanent exhibition begins with outlining the history of the church, from its precursors to the current structure and up to the rise of Nazi power. The latter is the topic of the next section, which covers the years 1933 to 1943, i.e. up to just before the disastrous aerial bombings of Hamburg. This also includes aspects of how the Nazis exploited the bombings of German cities for expelling Jews (and giving their flats to bombed-out “Aryans”) as part of the Holocaust. Adjacent to this second section is the extra section about Warsaw, before you get to the fourth and main part of the exhibition, the one about “Operation Gomorrah”. This also gives the entire exhibition its official name: “Gomorrah 1943”. This main part incorporates parts and exhibits from the previous older exhibition, but also adds significantly to it. It is also more modern than had previously been the case in that it involves contemporary media installations. For example you can listen to eyewitness reports at audio stations. One main addition is also a large horizontal info screen, which, for instance, describes the physics of a firestorm and has an animated schematic description of the Allied bombing strategy. The latter mainly involved using high explosive bombs first to “break open” the roofs of houses and then in a second wave drop incendiary bombs to set all these buildings ablaze. A particularly interesting detail: I found the panel with a quote from a former bomber command navigator who declared that it was only the invisibility of the victims from the bombers that it made it possible for them to rain down death on such masses of civilians. Had they seen babies and mothers burning to death, they could not have done it. But he also remarked that at the time their sole concern was to just get out of the whole raid alive themselves. This contrasts with the totally unrepentant declarations of the ideological basis of the use of large-scale aerial bombing of cities, e.g. by the main man on the British side, Arthur 'Bomber' Harris, who proclaimed that the intention of the operations was simply to break the morale of the civilian population. Had that indeed been the sole rationale behind the bombings then they could just as well have called them off, given to what minimal degree they were achieving this goal. So there must have been other reasons, plus simply the fact that it could be done, as from mid-1943 the fortunes of war had so turned in favour of the Allies. The exhibition continues by looking at the aftermath of the bombings – both in the short term, i.e. how people coped with living in the rubble and with the clearing-up efforts, as well as the longer term. The latter is given a separate final section: commemoration of the Hamburg firestorm. Apart from more eyewitness memories there are panels and photos listing the other memorials within Hamburg that pertain to the same chapter of the city's history, including bunkers (especially the Bunkermuseum Hamm) and the special sections and memorials within Ohlsdorf cemetery. Just before you get back to the foyer there's a map showing which parts of Hamburg suffered from the destruction to what degree. It is telling that the largest areas worst affected were not so much industrial parts of the city but the districts in which mostly working class civilians lived, namely in the eastern half of Hamburg (so it looks as if most of the bombs overshot their officially declared target by quite a few miles). All in all, the exhibition is well worth a visit. It is now also largely bilingual, with most texts (explanatory texts and labels – but not original documents) coming with English translations. These are not always one-hundred per cent perfect linguistically, but perfectly sufficient to guide foreign visitors through it all. 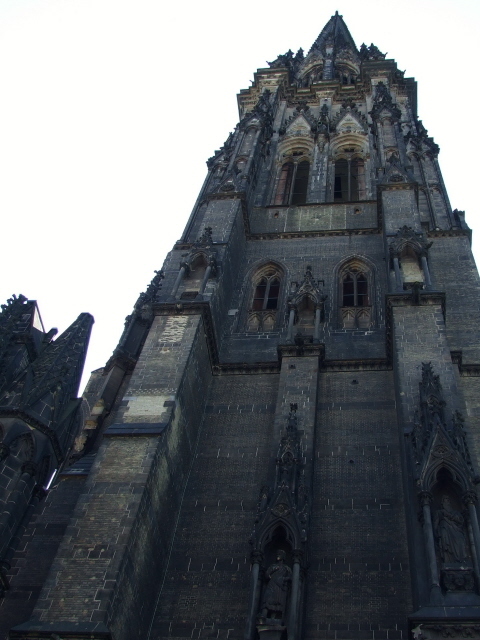 However, the centrepiece of the Nikolaikirche memorial is still the church tower itself. 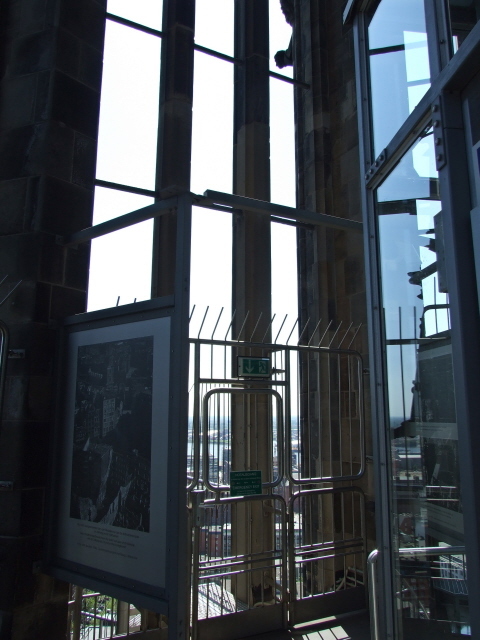 And this has been made accessible for the public: since 2005 a newly installed glass elevator has been taking visitors to a new observation platform in the church's spire at 250 feet (76m) above ground. Apart from the glorious view over Hamburg that is to be had from up here, there are a set of panels showing old photos taken from the same spot chronicling the destruction around the church tower in 1943. The fact that you can compare these with the view today makes the magnitude of the destruction back then all the more poignant. Location: right in the centre of Hamburg, on Willy-Brandt-Strasse 60 (formerly Ost-West-Str. ), only a few minutes' walk from Rathausplatz by the City Hall to the north or the Speicherstadt to the south. Access and costs: Very easy to find; not too expensive. Details: Owing to its central location it is very easily reached on foot – the closest public transport points are the U-Rödingsmarkt metro station (Line U3) or the regional metro train station of Stadthausbrücke (S1). The official name of the site is "Mahnmal St. Nikolai". The charge for the lift to the observation deck and admission to the museum/documentation centre is 5 EUR (concession 4 EUR, childern 3 EUR). You cannot opt for just one of the two. Tickets are only sold for both. Opening hours: daily 10 a.m. to 8 p.m. between April and September (during the rest of the year only to 5.00 p.m.). The open-air parts at ground level are freely accessible at any time. Combinations with other dark destinations: in general see Hamburg – in the immediate vicinity there's nothing of particular interest to the dark tourist. However, the U-434 Russian spy submarine isn't too far away, moored between the Landunsgbrücken and the Fischmarkt on the harbour front. You could also consider combining one of those tours of the air-raid shelter at Steintorwall (offered by the Hamburger Unterwelten – 'underworlds' society) with a visit to the Nikolaikirche memorial either before or afterwards – which in a way would be thematically fitting too … Furthermore, the metro allows quick access to the even more closely thematically related Bunkermuseum in an old air-raid shelter in the district of Hamm (take the U3 eastbound to Berliner Tor and change to the U2 for three stops in the direction of Mümmelmannsberg). Combinations with non-dark destinations: see Hamburg – given the central location of the Nikolaikirche memorial site, many of Hamburg's top tourist attractions are within easy reach on foot, e.g. the Rathausmarkt central square at the bottom of the Binnenalster inner-city lake, or the main shopping street of Mönckebergstrasse, the Speicherstadt (historic city of warehouses), and last but not least the banks of the river Elbe, including the Landungsbrücken landing stages where many of the ubiquitous and ever popular 'Hafenrundfahrten' boat tours of the harbour depart. Just round the corner from the Nikolaikirche you can find Hamburg's oldest houses by the Nikolaifleet canal – and esp. at the Deichstraße (which is also heavily developed for tourists).